Is it possible to accurately calculate quality? Health care experts weigh in on opportunities and challenges. Health care’s quest to define and measure quality has reached a feverish pace in recent years, laying the groundwork for a broad field of metrics and parameters that is dizzying for those responsible for reporting them. And yet, as the industry discussion and debate over what to include and what not to include continues, many frustrated stakeholders can’t help but ask the question: Can we really measure quality? Kathleen Blake, MD, vice president of health care quality for the American Medical Association, notes that the most commonly adopted framework for health care quality is the model created by the National Academy of Medicine (formerly the Institute of Medicine). The six domains laid out by the organization point to care that is timely, equitable, safe, effective, patient centered, and efficient. “Each of those dimensions should be considered when we talk about how we measure health care quality,” Blake says. For providers, the question of efficiency and cost-effectiveness has become a matter of urgency as the burden of quality measurement has reached a tipping point, necessitating recent action on the national level by the Office of the National Coordinator for Health Information Technology. Offering some perspective on the problem, Blake notes that she is aware of some physician practices that are expected to report on more than 1,000 measures. “No one can keep up with that many measures, but especially if they are similar but not identical,” she says, adding that there are simply too many groups developing quality measures in siloes, leading to a convoluted state of affairs across the industry. Notably, different stakeholders—whether regulatory, private health plans, or quality certifying bodies—draw from a deep well of evidence and often produce “similar” measures to address the same issue. In essence, providers may have to pull data together in multiple ways for what is essentially the same performance improvement goal. Gorman-Klug believes the industry has made great strides with quality over the past decade, noting that she can recall a time when it was rarely discussed. Today, the good news is that health care is moving closer to ensuring quality of care throughout the patient journey. Caloggero agrees that the industry has made major positive strides by introducing such measurements as the Electronic Prescribing Incentive Program and health information exchange measure requirements for the Merit-based Incentive Payment System of the Medicare Access and CHIP Reauthorization Act. “Compliance with these measures has a direct positive impact on the safety of the patient,” she points out. On the flip side, Caloggero suggests that there are other measures that simply miss the mark, including the NQF-0097 (Care-1, Medication Reconciliation Post-Discharge). In this case, she explains that the caregiver may be performing exactly what is needed to achieve optimal safety and medication adherence by patients—specifically, updating their local medication list—and ensuring that the patient or caregiver understands dosage and frequency. Yet, the NQF-0097 numerator is merely seeking documentation that medications have been reconciled against the hospital discharge summary. If this text is absent, the provider fails the measure for the discharge. While the industry has made progress, Blake acknowledges that much more needs to happen before the evolution of quality measurement can move closer to maturity. Some disciplines, such as cardiology, where vast amounts of medical evidence exist, are much further along in terms of defining quality metrics than others. Simply put, the industry is recognizing that quality must be measured across the full patient experience, from beginning to end, according to Gorman-Klug. “To do this correctly, you need to measure processes and all people contributing to a patient’s care,” she says, adding that it’s everything from how long patients wait in an emergency department and the cleanliness of a facility to SDoH nuances and the care received from physicians and nurses. The industry is recognizing that the various stakeholders along the continuum have different priorities, Blake says. A recent survey conducted by University of Utah Health in conjunction with Leavitt Partners found that there is a wide range of focus areas when it comes to health care quality. For example, employers are most concerned about the satisfaction of their employees and accessibility of services. Physicians, on the other hand, associate quality with close adherence to clinical practice guidelines and scientific evidence. For patients, the priority is outcomes and relationships. “It’s not that we are speaking different languages, but it’s almost that it could be different dialects,” Blake says. Electronic Documentation: Quality’s Friend or Foe? Caloggero points out that quality measurement is only as good as the documentation it draws from. While ICD-10 introduced more specificity into the medical record, current electronic systems are challenged when it comes to pulling out the full patient narrative. Gorman-Klug notes that the primary goal of documentation integrity is to capture the entire patient journey and story. The importance of documentation improvement initiatives in the age of value cannot be understated. “I’m a nurse, and one of the very first things I was taught is that if it’s not documented, it didn’t happen or doesn’t exist,” she says, noting that the technological tools, such as virtual assistants and artificial intelligence, can help improve documentation integrity and improve patient care. For example, if a patient presents with pneumonia, health care organizations can use these tools to determine where the condition originated. For example, whether it was acquired in the community or from a long term care facility. In addition, care managers should be able to identify such nuances as medications and preexisting conditions that make a patient more susceptible. Yet, while technology is a significant enabler of quality measurement, it can also create barriers. • Inconsistent configuration and workflows within an EHR may have achieved a common local definition but fall short of effective communication when conveyed via CCDA to an external system. For example, documentation of “never smoker” in one system may be locally interpreted as “never tobacco user” but be ambiguous when received externally. 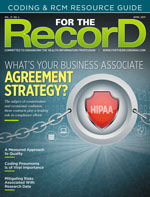 • Importation of discrete data via the receipt of a CCDA is burdensome on staff in most, if not all, EHRs. The tedious process of addressing each attribute demands a heightened intelligence in the next generation of EHR development to achieve what was desired in a more efficient and cost-effective manner. Blake notes that the reliability of data is dependent on all stakeholders confirming the same result with a specific data element. Beyond the problem with disparate systems, she says that methods of collecting data vary across the industry and can produce different results. For example, a measure of the left ventricular ejection fraction can be reported using an ultrasound, angiogram, or nuclear stress test. “The challenge is that each of those methods comes up with a different result that may be off by five to 10 percentage points,” she says. Measuring health care quality is certainly a fluid initiative on the macro level, one that the industry is working to refine. Yet, there are success stories of leveraging quality data to improve care. Marchant says it’s about learning how to make data actionable to support specific quality and compliance initiatives on the micro level. For instance, a Transitional Care Nursing Program implemented by Southwestern Vermont Medical Center drew on the power of a quality dashboard to improve readmission rates. In one year, the organization reduced readmission rates by a staggering 43%. • harmonizing measures through industry consensus so that quality measurements reflect an apples-to-apples comparison. Is it too tall an order? A lot rides on that not being the case.